It is recommended that Write Register only be used on Local Network Not Remotely. 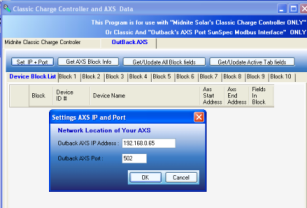 Enter IP address and port of Classic you wish to connect to. If you plan on writing new Values to Classic you must enter the serial number (with out leading zeros) of the Classic To unlock write mode. 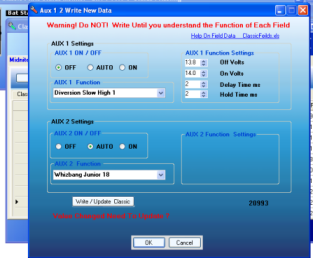 If The Classic is already Set-up in the main settings of the Program then you you can click set to C1, C2, C3,C4 to transfer settings from main settings. 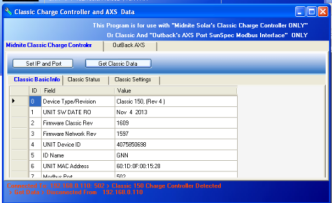 Once IP and Port are set, simply click 'Get Classic Data' Only a selected number of common Classic Registers are Shown.. Click the Tab you wish to view. Not all fields are Writeable, the fields that can be changed will show a 'Write' Button. 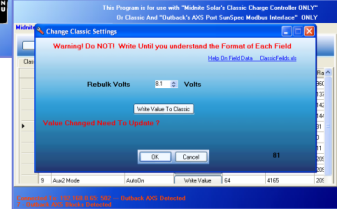 The 'Classic Setttings tab' Contains Classic feilds that are changeable, to change a value Click Write Value Button. A warning Digiloge will be displayed. Click OK to Cointuinue. Warning !! Make shure you enter valade values , incorect values could Cause Damage to your Equipment !! 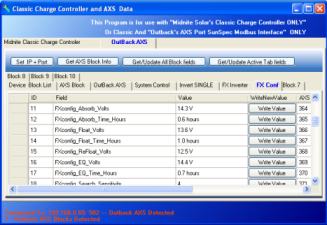 Note : You Can Not Access The Outback AXS Until you Have Successfully Connected To a Classic Charge Controller At Least Once with This Program.